The USS EMORY S. LAND (AS-39), the first of the Emory S. Land-class submarine tender, was commissioned on 7 JUL 1979. Built by the Lockheed Shipbuilding of Seattle, Washington, USS EMORY S. LAND first deployed to the Indian Ocean in September 1980. In July 1986 EMORY S. LAND represented the US Navy as the Command Ship of a contingent of navel vessels in New York harbor to mark International Naval Review and Fourth of July re-dedication of the Statue of Liberty. USS EMORY S. LAND circled the world in 1988. 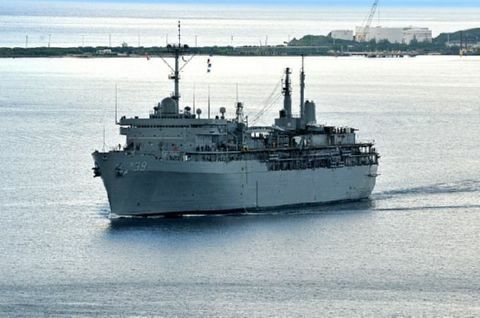 In 2010 EMORY S. LAND took up station in Diego Garcia in the Indian Ocean, where she continues to service the fleet, always true to her motto, "The Best to Support the Rest". AUG 2007 - NOV 2007 Change of homeport to Bremerton Wa.